Impossible to distance yourself from your problems if your problems lie within. Appreciate stillness and the profound benefits it can have. Speaking to Leonard Cohen, Cohen says “What else would I be doing? Would I be starting a new marriage with a young woman and raising another family? Finding new drugs, buying more expensive wine? I don’t know. This [sitting silently] seems to me the most luxurious and sumptuous response to the emptiness of my own existence. Set up a secular sabbath – time away from work, emails, internet, screens, etc. 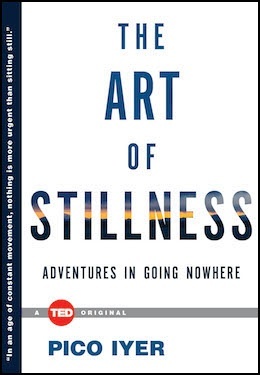 This entry was posted in Books and tagged Meditation, Pico Iyer, Stillness on March 31, 2015 by Blas.